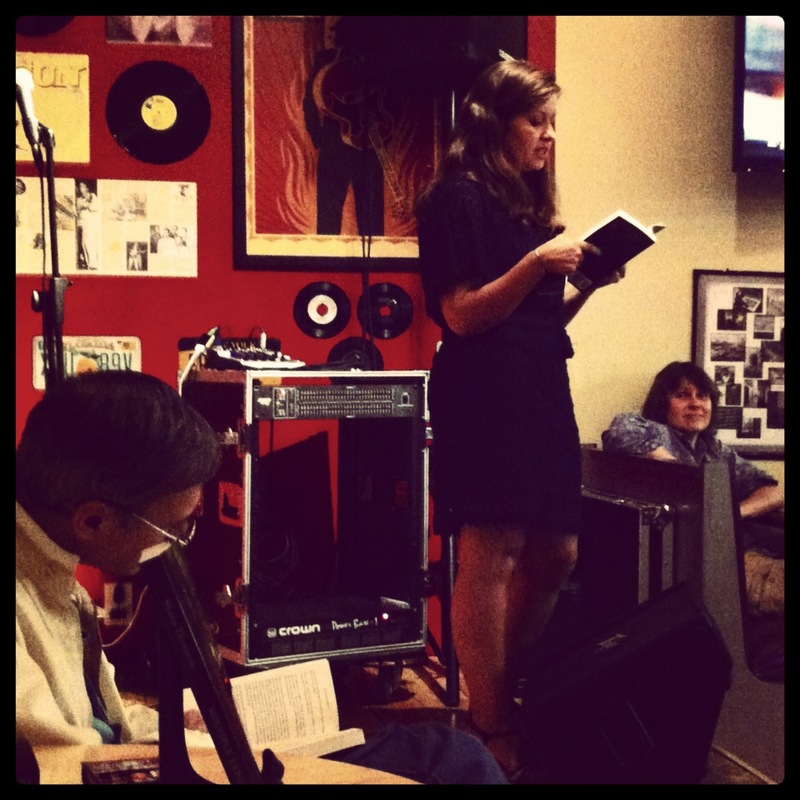 Reading at Book Launch Party, New South Coffee Company, September 14, 2012. At the Book Launch Party, I was greeted by readers, patrons, friends and family. Signing copies of the book prompted temporary writer’s block, as I wondered what sentiments to share until the words began to flow. And then, I felt gratitude for those who dropped by to pick up a book and those who stayed to listen as I read a brief excerpt. I was saying, “Thank you for taking the time…” when “Brrrrrrr!” the coffee grinder revved up from behind the counter, just in time to save me from becoming overly sentimental, and to remind me to get on with it. The grinder pulsed and chewed up the beans, and I shouted a little, “Thanks again to the readers and editors who are here tonight”– and the grinder interrupted again, “BrrrrEEEERRRRR!” I chuckled and paused. After the motor wound down, I kept going. I made it somewhere close to the line, “This is a serious book,” when “Whhhheeeeee!” the blender’s motor sped in its liquifying whirlpool. The frothing pitcher bounced below the steaming wand, “Kkkkuuuwhew, kkwhew, kkwhew, kkkkkkkk!” I didn’t become exasperated and someone asked me how, why, and I shrugged, thinking about how many times while writing, I’ve been interrupted by a baby, a toddler, and a dog with a deep, echoing bark. By the time I began reading the excerpt, the coffee orders settled and most people were easy in their seats, sipping drinks or puckering against a straw. I chose a kid friendly passage and was happy about the decision when I noticed the couch filled with my friends’ children in the center of the room. During the reading, they were quiet, watching me and, actually, listening. But, I still had to edit a little, just so the parents didn’t get premature questions on topics that they would like to be delayed. I look forward to the next reading event and whatever unique challenges it brings. The best part isn’t reading from the book, it’s interacting with the listeners and readers. You can read Stacy Leiser’s articles “Images Echo in Multiple Exposure” and “Multiple Exposure Comes into the Light”. For a calendar of my upcoming reading events, click here. Multiple Exposure is now available for purchase on Amazon in paperback and on Kindle. This entry was posted in Writing and tagged book launch, events, Multiple Exposure, reviews by shanathornton. Bookmark the permalink.